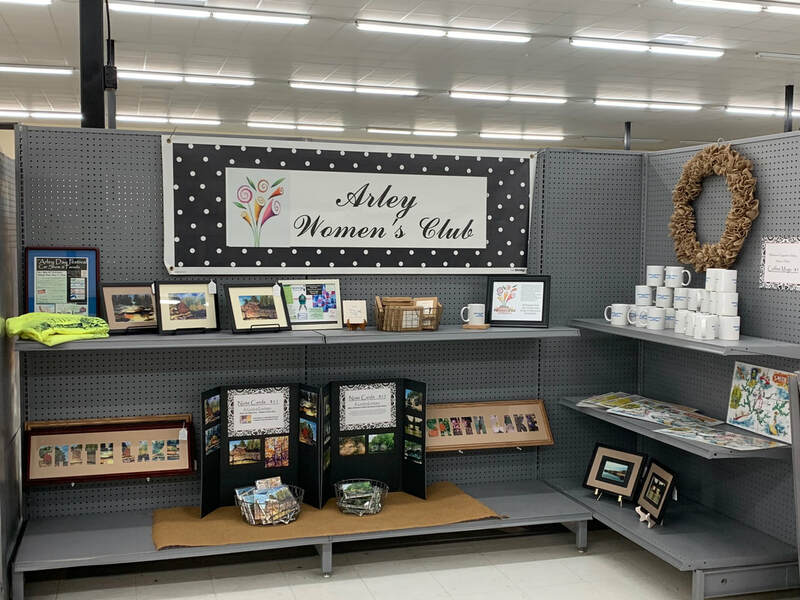 Those of us who have lived around Smith Lake "forever" already know that the Arley Womens' Club "AWC" in Arley, AL "The Heart of Smith Lake" is a group of ladies who are THE movers and shakers of this area. They put the "Heart" in "The Heart of Smith Lake." We know that if you want something accomplished in our neck of the woods, you need to have the AWC involved, because not only can they make it happen, they WILL. 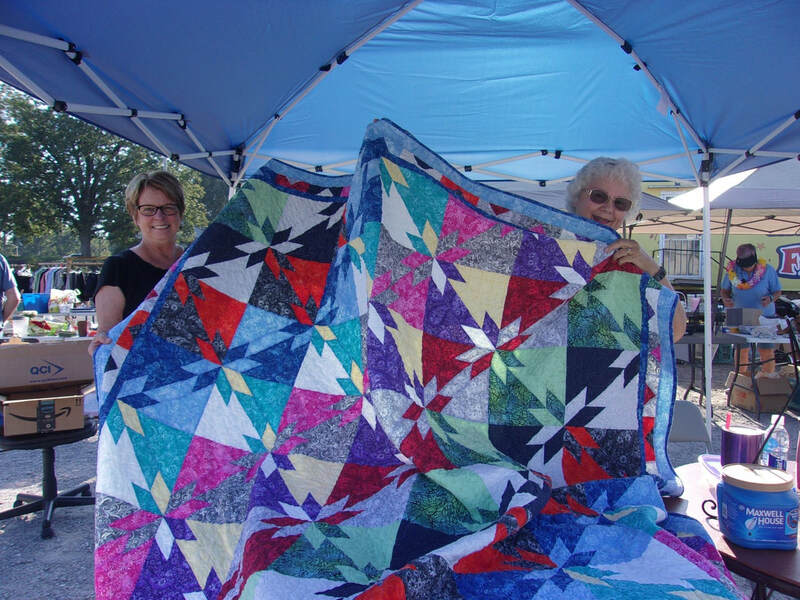 This organization, now over 130 women, has been committed to improving the community of Arley and its surrounding areas since inception in 1973. They are a non-profit service corporation who seek to specifically emphasize education and community growth in their area. Their tagline is aptly "Anything's Possible!" At their regular meetings, you won't find them sitting around shooting the breeze sipping sweet southern iced tea and eating pretty dainty petit fours. OH NO, these ladies mean business, and they are in it to get their hands dirty to reach their goals. That's not to say that they don't have fun, because they have loads of fun together going to dinners, fun day outings, bonding trips, annual club events, and so much more, but when it comes to the meetings and the goals they set each year, they are all about "getting it done." We encourage you to seek them out, learn more, and considering going their group. If you want to know more about the amazing women of Arley Women's Club, check out our article in the QTR2 2018 (Spring) edition beginning on page 59. We'll also post some important items below for your convenience such as their yearly calendar, event posters, etc. You may also find them at the links below. Let us know if you need more information! Facebook page for AWC: "Arley Womens Club"
Facebook event page for the Annual Arley Day Festival is: "Arley Day 2019"
What's going on with AWC? Contact the Arley Women's Club on Facebook to order your "Cooked on Smith Lake" Cookbook now!! Over 300 recipes of family favorites from ladies right here on the shores of Lewis Smith Lake. Artwork for the book cover by talented Teacher and Professional Artist Susan Ripp. Find out more about Susan's work on her Facebook page or on her website. AWC has added a booth a the new local "Smith Lake Market & Vintage Mall" on County Road 41 in Arley near the Dollar General. ​Go by and visit their booth and find items like: T-shirts, coffee mugs, coasters, die-cut picture frames, and Smith Lake placemats. The late Kathy Hamner had taken many beautiful photographs of the lake, and the club has featured her work on note cards for some time. Our talented club member Artist Susan Ripp has donated several of her original watercolors, and has provided the artwork for our newest Smith Lake watercolor note cards. Lakeside residents love sending little remembrance gifts home with lake guests, so they'll be adding items in the future. 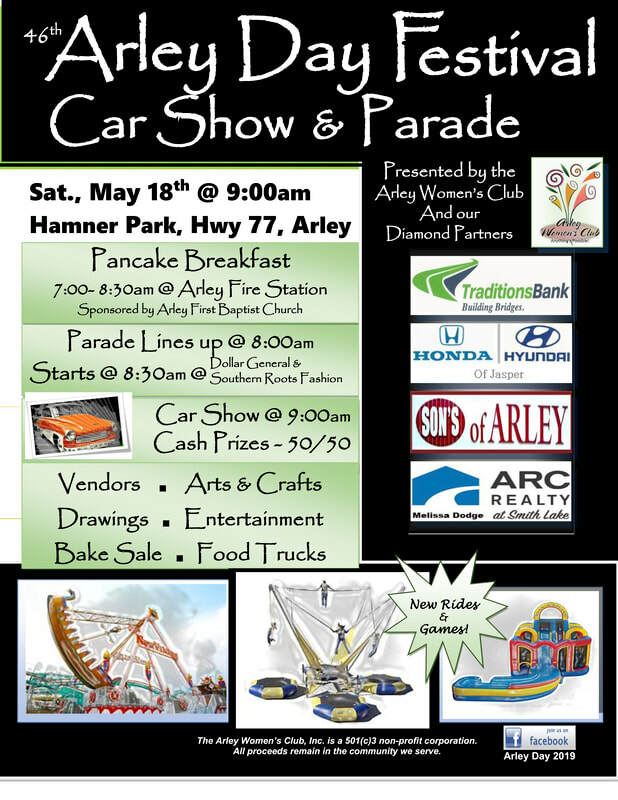 Watch for hand-crafted pottery and other unique creations by AWC members…with a Smith Lake theme! The proceeds from sale of these items will go to our educational scholarships. The Women’s Club has been proud to award annual scholarships since 2006! Watch the Facebook page for AWC, and they will post lots of reminders about current events in their area, as well as showing their monthly meeting dates, times, and places. Get involved! See the official poster for the 2019 Arley Day Festival event. Below is a look at the biggest prizes being given away at the festival this year. You may purchase tickets for a chance to win now. Check out the poster for details about that, or contact the AWC directly. If you would like a booth for this year's, or next year's ARLEY DAY FESTIVAL - you can save and print the form below or find it in a printable format on the Facebook page for the AWC, or you can contact them for more information.